Our Abpromise guarantee covers the use of ab155345 in the following tested applications. Binds to the Fc region of immunoglobulins gamma. Low affinity receptor. By binding to IgG it initiates cellular responses against pathogens and soluble antigens. Found on monocytes, neutrophils and eosinophil platelets. 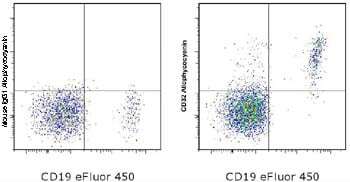 Flow cytometric analysis of normal Human peripheral blood cells with Anti-Human CD19 eFluor® 450 and Mouse IgG1 Control Allophycocyanin (left) or ab155345 (right). Cells in the lymphocyte gate were used for analysis. ab155345 has not yet been referenced specifically in any publications. Publishing research using ab155345? Please let us know so that we can cite the reference in this datasheet. There are currently no Customer reviews or Questions for ab155345.